After yesterday's snow, we had a sunny morning to work in the garden. 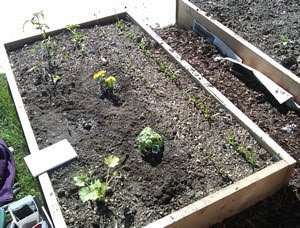 We placed recycled newspaper on the ground and shoveled mulched all around the raised beds. I planted my basil and cucumbers today (along with my token marigold). 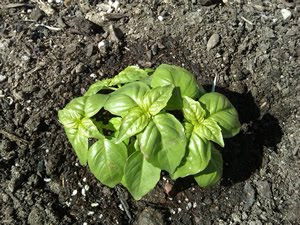 Oh basil, grow into a bush! It was great working with you yesterday, Paula.